New Year, New Garden Landscaping Tips! You may think that it’s a little too early in the year to be thinking about your garden. But with the start of the New Year, getting ahead now will stand you in good stead to actually enjoy your outdoor space when the weather is better. Here are a few tips on getting your garden landscaping right now during the winter months so that you can enjoy your garden during the summer months. First things first, take a good look at your garden. 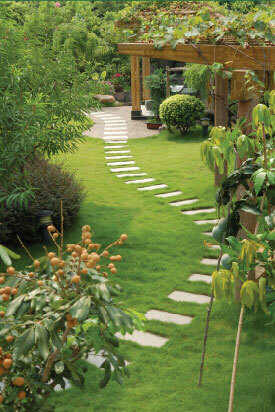 If you have a mature garden, you may only want to make small changes rather than having a complete overhaul. And this is fine: you may want to add some hard landscaping, such as an arbour, or maybe add a small decking area to a particularly sunny part of your garden. However, if you do feel like you’d like to have a complete change, having your garden newly landscaped in its entirety is something that you can work with your garden designer on now. While the garden is at its barest, you can see how much space you have, and between yourself and your garden landscaper, you can decide on your grand plans for creating the perfect garden. If you’re happy with your hard landscaping on the whole, but it has seen better days, think about replacing it. Patios may need weeding and cleaning, even if you decide not to replace them completely, decking struts may have become rotten over the winter months, and fencing and walls may have suffered some damage. Take stock of your hard landscaping, and speak to a professional garden landscape company to have items replaced as necessary. Something that’s not often thought about is the fact that if you start a garden project, you want it to be complete and achievable before the summer months. During the warmer months, you want to be enjoying your outdoor living, not sitting in a garden which resembles a building site. So speak to a professional garden landscaping company about what you can achieve in your garden before May, for example. A professional garden landscaping company will be able to compete the work in an efficient and timely manner, so it may be that you can achieve more than you think, as long as you get organised now. If you’re thinking about giving your garden a spruce up this year, get in touch with D&G Garden World to see what you can achieve. A little bit of planning and hard work now will pay off in the spring and summer months ahead.